On TV there are, of course, only two more episodes left before the whole show comes to an end, but here at my blog I will write more Merlin fan fiction in the not so distant future. One reason Morgana didn’t feature in “Let the Questing begin” was because she had such over-exposure on TV…the other reason was that I’m planning the next fan fiction piece in which she will feature, so hopefully you’ve enjoyed my take on the Merlin sagas enough to return for more! The Honeymoon is over: Let the Questing begin! Maria Thermann’s fan fiction “Merlin” (BBC series) sees the action set between seasons 4 and 5. This piece of fiction is written purely as a fun writing exercise and was not created with the intention of any commercial exploitation on my part. The copyright for all BBC Merlin series characters & storylines remains with the BBC and Shine Ltd, the producers of the show. The show stars Colin Morgan (Merlin), Bradley James (King Arthur), Angel Coulby (Guinevere), Richard Wilson (Gaius), Katie McGrath (Morgana), Rupert Young (Sir Leon), Eoin Macken (Gwain), Tom Hopper (Sir Percival), Adetomiwa Edun (Sir Elyan), John Hurt as the voice of the Great Dragon Kilgharrah and Anthony Head as King Uther. Never one for court etiquette, Gwen threw her arms around Gaius and hugged him tight, before bestowing a grateful kiss on the noses of Hueil and Sir Edward, who came staggering through the door after his friends, both hands still firmly clapped over his ears. The old court physician raised an eyebrow and peered at the wall opposite his door. “I certainly shall be when Merlin discovers his favourite painting’s gone. Why that boy should be so attached to the subject of mountain lakes is beyond me. I find him staring at that picture of Lake Avalon quite often.” Gaius shook his head, dislodging a squashed leach from his long, grey hair. It landed at his feet, where it squirmed in the dust until Gaius took his revenge and kicked it back into the burning chamber. “Perhaps it reminded Merlin of Ealdor, his mother’s village?” Gwen squinted at the burned remains on the wall. Blushing, Gaius sidled past his queen and scurried down the corridor as fast as his shaky legs would carry him. “You have no idea what ailments young maidens can report in the space of a day…and don’t even get me started on those drinkers in The Rising Sun tavern…and then there’s the bewildering subject of babies and childbirth! Erm…we’ll be safer down below, let’s head for the dungeons, my lady,” he cried over his shoulder, the queen following him with an amused expression on her face. Most of the physician’s supplies had been incinerated but the odd temperamental ingredient still snoozed safely in its earthen-wear pot or leather pouch. He collected what was usable and could easily be found in the smoke-filled chamber, flung the stuff into the cauldron, only half understanding what his queen had in mind. When nothing more useful could be gathered, they hurried back into the corridor and down towards the main stair case to the dungeons, until Gwen stopped abruptly at a particularly gruesome tapestry that depicted one of King Uther’s raids on the local druid population. Gwen wrinkled her nose in distaste, instantly letting go off Gaius’ arm. She picked up a corner of the tapestry with both hands and tore down Uther’s shameful reminder. When the dust cloud had subsided a secret door was revealed. “My lady, I don’t understand…you’d dare practicing sorcery…right here at Camelot under Arthur’s nose?” Gaius squeaked, mindful of the torch, it being within dangerous proximity of his long grey hair. Gaius sighed deeply, reluctantly following his queen down into the citadel’s bowels. Hueil and Sir Edward cluttered down the spiralling steps after them, each clearly dubious what this new scheme might possibly achieve in the coming battle. Geoffrey of Monmouth disentangled his head from the tapestry and trotted down the stairs, still muttering they should wait for Arthur to arrive. Her fingers gliding along the damp and moss-covered wall on her left, Gwen plunged into the gloom, raising her torch with her right hand to guide her party. The long tunnel ahead of them was lit up by just one wall sconce every twenty yards and sloped downwards, heading to the very bowels of the castle. Gaius had trouble keeping up with the lithe young queen. Above them, the bombardment never ceased, explosions and screams followed their descent, the stench of burning flesh already pervaded the citadel and spurned Gwen on to hurry even more. Hueil easily overtook Gaius with his long strides and fell in beside the queen, urging her to explain her plan, while her aged fellow conspirators tramped reluctantly behind them, trying to keep up. They finally reached a small, cave-like chamber, where they came to a halt at the outer dungeon gates. Gaius caught his breath and peered through the lattice work, where a heavily studded oak door led into the inner most secrets of the citadel. “It’s no use looking at me, there are no more spell books left in my library; Uther burned the lot.” Geoffrey panted. He rattled the bars of the outer dungeon gates, his breath finally catching up with his lungs. “Does anyone else hear this ringing noise?” Sir Edward asked nervously, his head cocked to one side like a bird’s. “I fear there must be sorcery at play. All I can hear is a strange ringing.” He clapped his hands to his ears and frowned. Gwen giggled and unlocked the gates with a huge key from the set dangling off the embroidered belt gathering her gown at her waist. She tripped lightly through the gates, the others following her less lightly, and pushed open the studded doors. Bright lights flooded the small cave-like entrance, causing everyone to squint. The clamour of many voices drifted up from the innards of the citadel and when Gaius sidled pasts the queen to cast an enquiring look down yet another set of stairs, he noted a long line of servants hurrying along the tunnels below, each servant laden with household furniture, a stream of ants on their way to a gigantic nest. “I thought the arrow hit his chest,” Geoffrey muttered, shaking his head as they walked down the steep stairs to join the throng of huntsmen, beaters, servants and maids, who streamed into the great cave that had been the Great Dragon’s prison for more than twenty years. In the centre, just under a natural sky light hundreds of feet above their heads, the servants had erected a huge pile of every flammable thing Camelot could spare. The conspirators found the severed end of the enormous chain that had once held the Great Dragon Kilgharrah prisoner and with the help of a couple of servants and with much huffing and puffing, Sir Edward and Hueil finally heaved the massive chain into position; it now led from the darkest part of the cave to the centre, where a rather oddly shaped pile of furniture grew with every new arrival of servants. “Leave it to us, my lady. I think I’ve got an idea how to lure him and his men into the tunnels.” Hueil grinned, already setting off at a trot with Sir Edward and several guards hot on his heels. “Splendid idea, Emma! And get the old rascal’s robes whilst you’re at it. He won’t need them anymore and this beastie of ours requires an awful lot of skin!” Gaius nodded encouragingly and strolled over to the ever increasing furniture pile. Emma handed tapestry and cushions over to a young lad, who scrambled up on the pile and stuffed the cushions into a tangle of chairs, before draping the tapestry over the arrangement. “Try to make it bulge out a bit more…yes, that’s it…just like a dragon’s brow. Well done!” Gaius encouraged the young squire. The boy flashed a shy smile at the old physician, before starting to drape blankets and sheets over a long line of upturned armchairs that sat on top of a pile of tables. The furniture-beastie wobbled dangerously, but the lithe young squire sprang from chair to chair with the agility of a squirrel without causing the pile to collapse. Gwen watched the creation of her very own dragon with pride. Every available servant, guard, hunter and squire had answered her call and was determined to defend Camelot. The royal guards and knights had taken up their positions by the cave’s various entrances, the kitchen servants were manning the fire baskets and Gaius skipped between all of them, handing out small leather pouches containing plenty of snap, crackle and pop to greet their unwelcome guests. “Arthur has truly created a realm worth dying for. I wonder if Leofwine’s men feel quite the same about their’s,” she muttered absentmindedly, when an exhausted messenger arrived and handed her a small piece of parchment. The man collapsed at her feet and had to be carried off. “For Camelot!” Every man, woman and child in the cave responded to the queen’s rallying cry, but their voices were drowned by the roar approaching from the tunnels; the onslaught of enemy shouts and taunts was accompanied by trumpet fanfares and drums and the unmistakable sound of clashing swords. /to be continued…before the end of this year! Part 10 was created on 14th August 2012. This latest instalment won’t please one faithful follower of this blog – there’s another cliffhanger, worse than the last, which means you’ll probably be dropping your greengages again (sorry, Michelle). Hope you’ll enjoy your Merlin weekend fan fiction nonetheless. 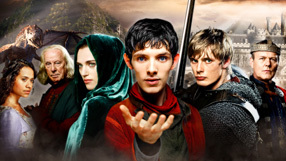 Maria Thermann’s fan fiction “Merlin” (BBC series) sees the action set between seasons 4 and 5. This piece of fiction is written purely as a fun writing exercise and was not created with the intention of any commercial exploitation on my part. The copyright for all BBC Merlin series characters & storylines remains with the BBC and Shine Ltd, the producers of the show. The show stars Colin Morgan (Merlin), Bradley James (King Arthur), Angel Coulby (Guinevere), Richard Wilson (Gaius), Katie McGrath (Morgana), Rupert Young (Sir Leon), Eoin Macken (Gwaine), Tom Hopper (Sir Percival), Adetomiwa Edun (Sir Elyan), John Hurt as the voice of the Great Dragon Kilgharrah and Anthony Head as King Uther. “Begging your pardon for the small deception, Your Majesty. My name’s Hueil and my lord is Prince Urien. He feared you wouldn’t welcome a messenger from Leofwine’s camp. King Arthur was alive and well up until last night and so was my lady Dragonara. That’s when my lord saw them last by the shores of Lake Merthur. He regrets there is no news of Arthur’s men; it appears they have been abducted by some bandits. My lady Dragonara and King Arthur must have gone after them, but there’s no need to be alarmed. So far none of Camelot’s knights seem to have been harmed or injured. We found traces of a scuffle, but no blood to speak of.” The man calling himself Hueil inhaled deeply, relaxing visibly, now that his errant had been discharged. Gwen had barely arrived at the eastern gate, when Hueil discharged his message at breakneck speed. Behind her Gaius panted down the battlements, his face red and his long grey hair dishevelled from running down the steep staircase of the main entrance to the keep. Now he had to lean against the gate post to catch his breath. Gwen turned to the messenger and was about to greet him, when Gaius intervened. “Food? Your lord?” Gaius barked and gesticulated wildly, his hand pointing at a number of empty baskets and crates lined up against the enceinte, Camelot’s defensive walls lining the ramparts. “Oh yes, Prince Urien arranged for refreshments as a token of his esteem and friendship. He begs you to allow him time to calm his father’s mind. I trust the few trifles my lord sent were to your liking, my lady?” Hueil’s exterior belied his inner refinement. Gaius approved of the man, despite the torn leather breeches, dusty coat of mail and generally unwashed appearance. One look at his queen told the old physician she also approved of the man and his lord. Gwen beamed a smile of gratitude that would have melted the heart of King Odin himself, Camelot’s grumpiest neighbour. Hueil had clearly been instructed to repeat Urien’s words to the letter…and Prince Urien could have gloated over the citadel’s lack of provisions, but he chose to call the much needed food simply refreshments, as if Queen Guinevere was preparing for a picnic instead of hoarding for a siege. It was Hueil’s turn to beam. A smile stole across his stubbly features and his grey eyes lit up. “My lord was hoping you’d propose such a scheme. Your gracious Majesty is too young to have met her, but my lord Urien’s very much like his mother, who was as wise as she was beautiful. When she was alive, the realm of Dunadd was prosperous and at peace with all its neighbours. He’s out on an errant for Leofwine, but as soon as he returns, he’ll send word by my hand. I bid you good day, my Queen.” Hueil bowed deeply and turned to walk back to his encampment. Gwen turned away briskly but not fast enough to hide a touch of pink stealing across her cheeks from Gaius’ keen eyes. “I have no idea what you’re talking about. It was a slip of the tongue, Gaius, nothing more.” She picked up her skirts and lightly tripped up the stairs to walk back up the ramparts and into the main courtyard. “Slip of the tongue, my foot! Our Gwen’s turning into quite an accomplished little sovereign. Speaking of feet,” Gaius squinted at his swollen toes and sighed, “it’s about time mine got some rest.” He walked back into the main courtyard and selected a quiet spot against the wall of the chapel to watch the comings and goings of the servants. When he had settled comfortably, he pulled off his sandals, took out a leather-bound book from under his cloak and began reading the next passage concerning Dragons and their Ladies, a major work by the notoriously romantic writer Aurelius Smarticus the Younger. No matter how hard he tried to concentrate on Aurelius and his lusty dragons, Gaius’ mind kept drifting back to the conversation at the eastern gate. Gwen’s willingness to ignore her newly acquired superior rank and give precedence to the prince boded well for the negotiations. More than that, she had shown great skill in allowing Urien to save face. Who’d want to admit their parent was a jealous lunatic, apt to fly off the handle and ride into battle at the slightest provocation? And what about that curious absence of any reference to Leofwine’s or Dragonara’s rank? Gaius guessed correctly that Urien’s favourite messenger had no respect or feelings of loyalty for either his king or queen. Perhaps in his mind he had already usurped them with a new king, namely his lord Urien? If that should prove the case, it was a circumstance to be exploited. Out there in the camp there might be soldiers baying for Camelot’s blood, but they were mercenaries, men who could be bought. Arthur’s knights and soldiers on the other hand were loyal to a fault. If there was the slightest chance of a revolt by Leofwine’s knights and army, it was something to be promoted by Camelot. Leofwine’s kingdom was vast; with Urien on the throne as Arthur’s ally the four kingdoms surrounding Camelot might stop squabbling over boundary issues and finally be at peace. Arthur could fulfil his destiny and heal the lands, unite the kingdoms and make Albion strong forever. Healing…it was the essence of the old man’s own heart. Yawning, Gaius became acutely aware of the sun’s rays searing his nose and checked for any blistering on the sore spot Gwen’s radish had left. He wiped the sweat from his face with his sleeve and rose slowly to find a shadier spot under a covered walkway, where he slumped down on a stone bench and stared with unseeing eyes into the courtyard; maids hurried by with baskets full of old sheets, which were to be torn into strips to make bandages. A couple of grooms walked slowly up and down with buckets, collecting horse manure to be used in the kitchen gardens, where the gardeners were covering every inch of soil with carrots, cabbages and onions. Gaius felt slightly ashamed. Had he not been dozing in the sun, when he should be helping Gwen in the last few hours before the siege on the citadel began in earnest? But what could he do – he was just an old man? A healer at that, not a soldier. He was a healer of people’s bones and looked after their insides, not a physician treating a cuckolded king’s hurt pride. To heal the lands, for that they needed Arthur! Healing Camelot’s leadership was Merlin’s destiny…but how could he heal a realm that had been torn apart by Uther’s relentless persecution of those who had practiced magic and those who still followed the old religion? Gaius rubbed his eyes with his knuckles and yawned…healing powers were such a valuable thing to have…Urien was also in need of healing for his lands. After decades of waging war on his neighbours, Leofwine’s kingdom must be just as exhausted, devastated and in ruins as the realms outside of his borders. What a legacy to leave to his only son! Gaius started. He stared at Aurelius’ book lying openly across his knees. Dragon’s and their Ladies…dragon queens gave birth to dragons’ eggs…and if the eggs were female…the dragon inside could potentially be another queen and might turn into anything, including a beautiful maiden. Could such a maiden be a threat to Arthur and Gwen’s happiness? He swallowed hard, when the image of a dragon’s egg rose up in his mind. What about Aithusa, their very own fire-breathing, hiccupping baby dragon, currently making life unbearable for Camelot’s native squirrel population? Gaius weighed up the chances. On the whole he thought Aithusa might be a girl, but not a dragon queen. The egg Merlin had brought back was blue, not golden. Merlin had said the hatchling was completely white, no silver spikes running along its spine. Then there were Arthur’s feelings for Gwen. Could a chance encounter with a mysterious beauty turn his heart? He’d had so little experience of women’s ways, the lack of princesses in neighbouring kingdoms had seen to that. Had Arthur’s heart ever truly recovered from Gwen’s betrayal with Lancelot? Gaius sighed and turned to the next passage in Aurelius’ book. Perhaps Aurelius the expert on romance knew how to heal a broken heart! This time Gaius sat up straight and knew he had found the answer. Healing powers! A dragon queen could not only heal that which was hurt or injured…she could heal what was barren and dead! Gaius gathered up his tunic and cloak and raced up the stairs taking two steps at once. The two guards at the entrance stared after the old physician, as his bare feet pelted past them and into the keep where his queen was still blissfully unaware of Leofwine’s deadly plans. She sauntered downhill past clumps of cornflowers and red poppies, her fingers running over the plump ears of grain that was growing all around her; Bede snatched a few wild flowers, munching happily after their long journey, his huge belly swaying gently alongside the girl. Their combined movement stirred a swarm of flies riding on the balmy air. Eleanor swiped them away impatiently, sending the living cloud straight up into the air, where a passing swift welcomed the unexpected meal. The bird reminded Eleanor it was important to reach the bridge and safety of the castle before the sun set and she gave Bede’s rear an affectionate slap to hurry him along. Once or twice she looked over her shoulder, but did not espy what she had feared to see. Bede snorted his agreement, prompting Eleanor to perform a happy little dance. Horse and girl were exhausted, they had ridden hard and far to outwit her father’s favourite retainer, finally shaking him off at Osthryth’s Fort, where his horse had met with a small accident during the crossing. As a minor member of the gentry, Oswiu held just one manor with no more than two hides of mainly hilly land that provided barely enough to feed the peasants living there, let alone keep a royal wife in the comfort she was accustomed to. Yet Oswiu’s family had long-held ambitions for their son to rise far above his station. Eleanor had seen him looking at her in a way no king’s retainer should ever dare employ towards a princess of the realm. One time, when Bede had been sick and she had visited him secretly during the night, Oswiu had followed her to the stables and had pressed his case. She had threatened to expose him to the King, but Oswiu had merely laughed and said, girls with mothers like hers should remember their place. Since that day she knew Oswiu lacked the necessary scruples and would not hesitate to take her by force, thus claiming his entitlement to a throne that might soon become vacant, if Leofwine’s self-destructive path continued along the lines as it had done of late. With Eleanor the monarchy’s bloodline continued by the king’s decree. Leofwine had declared his step-daughter to be a legitimate heir, should any misfortune ever befall Urien. Unlike her own mother, Leofwine had always doted on her from the time she’d been small. Hadn’t Dragonara let it slip often enough how Urien was the result of magic rather than a son born of noble blood? 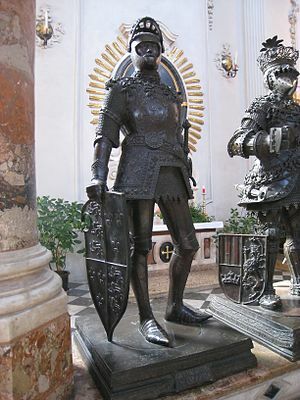 No wonder the king had turned to the child he knew was most decidedly of royal blood. Her father had been King Bicoir of the ancient kingdom of Lot and Queen Dragonara’s bloodline was as old as the Earth itself. Her mother’s reputation might have been tarnished by her entanglement with Nechtan, but noble blood was noble blood in any book on heraldry! Eleanor stopped her merry dance abruptly. Was that why Urien had kissed her in the cave? In her own mind and to the world at large they might be step-brother and sister, but they were not really related at all. If he took her for his wife…it would appease the barons and nobles of Dunadd, who were on Dragonara’s side, but what about the troops still loyal to Leofwine and the mercenaries he had allowed into the realm? She breathed in deeply, sucking in the cooler evening air, hoping to bring clarity to her troubled mind. Letting go off the bridle, she permitted Bede to make his own way down to the water’s edge. The tips of her fingers touched her lips as she tried to recall Urien’s kiss. She closed her eyes and was instantly transported back to the scent of his skin and the warmth of his cheek against hers. The cry of a kite plunging out of the red sky into the parched fields below startled her. She opened her eyes and saw Bede had reached the moat and was grazing by the water’s edge. Eleanor hurried down the hill to join him and enter Castle Deira before nightfall. Concealed in the scrubland that formed the background to the moat to the west Oswiu was busy wrapping a cold compress around his horse’s front leg. The animal had stepped into a water vole’s hole and as a result had gone lame. Unwilling to give up the chase, Oswiu had barely made it to Castle Deira before Eleanor arrived on top of the hill. He patted the compress of mud and wild mustard seeds firmly into place. The mare was shivering, covered in sweat and worn out by pain and exhaustion. Oswiu regarded his horse with a frown, before leading his horse deeper into the thicket. A useless mare, should his quarry decide to flee! When he was certain the horse could not be seen from the moat or bridge, Oswiu crept back to the water’s edge and lowered his body into the moat. He swam across to the reed bed growing closest to the foot of the bridge and waited patiently for his prey to arrive. This time Oswiu wasn’t taking any chances. He knew what a wild-cat Eleanor could be. He’d watched her grow up, watched her tease that boy Urien. Oswiu smiled and drew his dagger. She certainly had fire in her belly! It was fine by him, but this time she’d not get a chance to stab him again! How she must have congratulated herself, when she got away at the Fort. He suppressed a laugh and ducked lower into the reeds, the cool water refreshing his senses instantly. Her body had felt so warm under his, her mouth defenceless against his lips, her hair smelling of roses and myrrh, her small fists pounding his back. Since that day in the stables he’d been unable to think of anything else. Oswiu’s mouth began to fill with drool, when he recalled the softness of her skin. He laughed. Eleanor was going to be juicier than a ripe peach; this time he’d show her, who was her true lord and master! Oswiu ducked lower into the reeds and held his breath. Eleanor had reached the water’s edge and was taking Bede’s bridle to mount and head for the bridge.